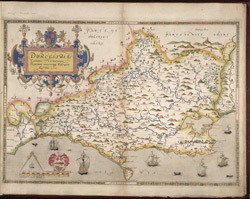 This map of Dorset is from the 1583 edition of the Saxton atlas of England and Wales. This atlas was first published as a whole in 1579. It consists of 35 coloured maps depicting the counties of England and Wales. The atlas is of great significance to British cartography as it set a standard of cartographic representation in Britain and the maps remained the basis for English county mapping, with few exceptions, until after 1750. Here the strap work cartouche is mounted by the Elizabethan coat of arms. The Seckford arms of appear at the bottom of the map, adjacent to the decorative scale bar which houses Saxton’s name. The adjacent counties are named but lack any internal detail, recording only the path of rivers that cross county boundaries. Relief, in the form of uniform rounded representations of hills, is the main topographical feature presented in the maps. Rather than provide a scientific representation of relative relief these give a general impression of the lie of the land. Settlements and notable buildings are also recorded pictorially; a small building with a spire represents a village, while more important towns are indicated by groups of buildings. Here Portland castle is marked by a castle symbol of two connected towers. Rivers, streams, parks and woodlands are also depicted carefully. Woods are shown by small tree-symbols, with clusters representing forests, and parklands enclosed with ring fences. Great decorative effect is provided by the detailed images of ships in the stippled sea.